WASHINGTON, D.C. -- This holiday season, 43% of U.S. workers say they plan to take a vacation during the holidays, and of that group, roughly half -- or 21% of all workers -- will completely disconnect from work. Meanwhile, 22% of workers will be taking a vacation but checking in with work via email or other means. Do you plan to check in with your work, by email or other means, while you are on vacation during the holiday, or not? These findings, from a Dec. 4-11 poll, show that the majority of workers will be connected to their jobs over the holidays -- either because they are not taking a vacation at all or because they will check in during their vacation days. U.S. workers are more likely to say they plan to take holiday vacation time than they were when Gallup last asked the question, at the beginning of the millennium. The 43% of U.S. employees who plan to take vacation time this holiday season is up from about a third of workers (34%) in 2000. Even with the increase, a majority of U.S. employees (57%) are not taking vacation time around the holidays. Still, many workers are probably getting some time off in the form of company-recognized holidays on Christmas Day and New Year's Day, for example, but the workers may not consider that vacation time per se. It's quite possible that remote-working opportunities have given U.S. employees a greater ability to take holiday vacation time, helping account for the uptick in the percentage of workers who say they will take a vacation this holiday season. Gallup did not ask about checking in with work among those taking a vacation in 2000. Do you plan to take any vacation during the holidays this year, or not? Gallup has previously found that remote working is on the rise -- 43% of American employees worked away from their team members at least some of the time in 2016, compared with 39% in 2012. 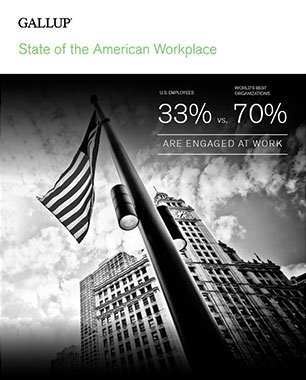 The trend is occurring across most industries Gallup has studied. While some holiday vacationers will log actual work hours, many may simply stay connected with coworkers via email or text, as most smartphone owners regularly check their phones throughout the day. Engaged remote workers in particular may feel that their flexible working situation allows them to spend time answering emails without feeling as though their personal time is being encroached on. The average number of days off that workers will take over the holidays has not changed significantly. Among those who report taking holiday vacation time, about half are taking off six or fewer days, while the rest are taking more than that. The average amount of holiday vacation time in 2017 is nine days -- similar to the eight-day average in 2000. How many days do you intend to take? Shifts in U.S. working styles are affecting Americans' ways of life, apparently including during the holidays. Many workers who used to have to choose between work commitments and holiday time with family have new opportunities to balance the two, based on email and other communication technologies -- allowing employees to keep in touch with work while traveling or at home for the holidays. More U.S. workers plan to take holiday vacations in 2017 than in 2000, but not for longer periods of time. Gallup finds that certain considerations need to be taken into account when managing remote workers, but this work-life balance yields benefits for employers and employees alike. And for many remote workers, being able to spend time with family over the holidays is the greatest benefit of all. Results for this Gallup poll are based on telephone interviews conducted Dec. 4-11, 2017, with a random sample of 546 adults, aged 18 and older, living in all 50 U.S. states and the District of Columbia, employed full or part time. For results based on the total sample of national adults, the margin of sampling error is ±5 percentage points at the 95% confidence level. All reported margins of sampling error include computed design effects for weighting. Taking regular trips is linked to higher well-being across all income groups. Those who earn the least but make time for regular trips have higher well-being than those who earn the most but don't take trips regularly. 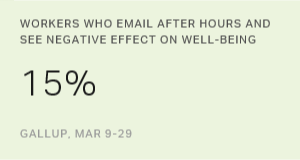 Few U.S. workers who use email after business hours see it as unreasonable or interfering with well-being, family or friends.